How Much Can You Make in an English Career? What Courses Can be Taken for an Online English Degree? English programs guide students toward writing excellency and literary understanding. Degree seekers learn how to organize their thoughts in specific formats, such as thesis statements for research papers and vivid settings for fictional works. They also study literary concepts and learn to analyze classical works. These insights equip learners to write for a variety of purposes, and to help others understand in-depth literary ideas. Many schools offer online programs in English and the humanities, but some do it better than others. Though online programs traditionally give students more flexibility than the their brick-and-mortar counterparts can provide, some of them have gone above and beyond to ensure that students get the most out of their program as possible. 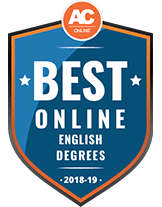 The following English programs have proven to offer the very best in their online program offerings, and have made our list of Best English and Humanities Degrees for 2018. The University of Central Florida offers 3 online English B.A. degrees in Creative Writing, Literature and Technical Communication, all focusing on the study of language, literature and writing. Students learn to read accurately, write clearly and think analytically. Sample courses include Theory and Practice of Creative Writing, Renaissance Poetry and Prose, Fiction Writing, Editing for Creative Writers, Writing for the Technical Professional, Literature of Science and Technology, International Technical Communication, Practical Criticism and Principles of Linguistics. To graduate, students must earn 120 credit hours and maintain a minimum 2.0 GPA. Graduates are prepared for various professions such as copywriter, educator, journalist, playwright, publisher, higher education administrator, lawyer, librarian, international communications professional, publications specialist, technical editor or writer, and web content specialist. Or, they can pursue graduate studies in English and other disciplines. Online students have access to many UCF resources including financial aid assistance, success coaches, academic advisors, tutors, library services and career counseling. The University of Central Florida is accredited by the Southern Association of College and schools Commission on Colleges. The online B.A. in English at the University of Illinois Springfield teaches students communication, analysis, presentation, editing, critical thinking, and creative and professional writing skills. Graduates will be able to write with confidence and precision, conduct professional research on academic, social and cultural questions, and be active in shaping the future of literature and culture. The English program prepares students for careers in many sectors, including education, business, media, museums, law and health care, as well as for graduate work at the masterâ€˜s or doctoral level. Students participate in interactive online learning communities and complete course work at their own pace within the same semester time frame as on-campus courses. Online students have access to the same educational resources, academic advisers and other course-related materials that on-campus students enjoy. All English majors are assigned academic advisors who assist students in developing their course of study. Courses cover literature, writing, and linguistics and include Early British Literature, Children's and Young Adult Literature, Creative Writing Poetry, Rhetoric and Composition in Digital Media, Poetry, Non-Fiction Writing and Editing. Classes are taught via a variety of tools, methods and strategies, including books, articles, websites and simulations, videos, images, quizzes and tests, asynchronous discussion forums, synchronous web conferences, projects and assignments. Class sizes can range from 15-40 students. To be accepted into the English program students must have completed 30 hours of lower division courses, 2 English composition and 2 literature courses, and 1 writing or rhetoric or grammar course. Advising, tutoring and career services are available. The University of Springfield Illinois is accredited by the Higher Learning Commission. The online B.A. in Humanities degree at the University of Texas of the Permian Basin is aimed at students interested in a broad arts and sciences degree with an interdisciplinary perspective unavailable through the combining of a traditional major and minor. Students create, with approval from a faculty adviser, an individualized study plan with an interdisciplinary theme, period, set of problems, specialization, or perspective from at least 2 concentration areas from Art, Communication, English, History or Music. The Humanities degree requires 120 total credit hours â€“ 42 general education, 30 humanities, 24 concentration area and 24 electives. Students must also complete a capstone senior thesis project. Online classes are taught via the Blackboard learning management system by the same faculty instructors as on-campus classes. Students can listen to lectures and complete assignments when convenient. Courses are just 7.5 weeks long, with 6 start dates throughout the year. Financial aid is available to degree-seeking students who qualify. The University of Texas of the Permian Basin is accredited by the Southern Association of Colleges and Schools Commission on Colleges. The B.A. in English at Judson College, available online, prepares graduates for any career requiring clear communication, graduate study and everyday life. The college's Distance Learning Program is designed for adult students whose circumstances prevent them from attending traditionally offered higher education. The program accepts transfer credit, credit by examination, assessment of prior learning, military education credit and contract learning. Students must complete at least 128 semester hours, including requirements for the General Education Core and English major. Many Distance Learning courses are offered in Moodlerooms, a learning management system that delivers content and activities. Other methods of course delivery include video, e-mail, mail, phone and fax. The course structure is provided by the learning contract, which contains instructor contact information, course description, required books, course objectives, learning activities, and method of evaluation and grade determination. Students have 2-4 months, depending on the contract, to complete each course, at their own pace. Up to 18 hours of courses may be selected for each enrollment period. The program offers courses that develop fundamental writing, speaking and critical thinking skills and address various literary periods and genres. Graduates are prepared for any profession requiring a mastery of language and many pursue careers in education, law, medicine, business and creative arts. A minor in journalism includes practical experience through internships with media outlets and the student newspaper. Additionally, Scrimshaw, the student literary magazine, presents the opportunity for creative and scholarly writing, editing and magazine layout. Judson is accredited by the Southern Association of Colleges and Schools Commission on Colleges. The B.A. in English at Troy University is available 100% online and helps students develop clarity and directness in the spoken and written language, an understanding of language and meaningful communication, and an ability to use linguistic and literary fact in everyday life. The B.A. is 120 credit hours, and students must maintain a minimum of a 2.0 GPA. Most classes last 9 weeks, instead of the traditional 16-week semester. There are 2 English minor options, in professional writing and creative writing. Troy uses the Canvas Learning Management System as a platform for online discussions, tests and collaborations with instructors and classmates. Courses include Contemporary American Literature, World Literature, British Literature, Creative Writing, Verse Writing, Forms and Theory of Fiction, Advanced Nonfiction Writing, Technical and Professional Editing, Linguistics and History of the English Language. Career opportunities include copy writer, desktop publisher, editor, librarian teacher, journalist, technical writer and creative writer. The school's virtual online community of students, faculty and staff on Trojan CafÃ© also offers information on academic, social, professional and collegiate resources and provides a series of student forums and message boards for students to connect. Troy offers academic advising, tutoring and career counseling support and will work with online students to explore financial aid and scholarship opportunities. Troy is accredited by the Southern Association of Colleges and Schools Commission on Colleges. The online B.A. degree in English from the University of Main at Presque Isle helps students communicate effectively, through proper writing, careful reading, critical thinking and effective speaking â€“ all skills necessary for success. Professors who teach live courses also teach the online courses and all have a Ph.D. or terminal degree. Online students experience the same student-to-faculty ratio as on-campus students. Courses are offered 12 months a year, including 2 summer sessions, so students can take classes that fit their schedules. Classes include critical reading, creative writing, core composition, professional writing, and literary and film analysis. To graduate, students must complete 120 credit hours, of which a minimum 39 are within the English program and 40 hours in General Education. A minor is optional. Participants are each assigned a full-time adviser who both teaches classes and ensures completion of the degree within 3-4 years. Graduates gain marketable skills such as critical analysis, interpreting data, creating persuasive arguments, writing concisely, meeting deadlines, organizing and synthesizing information and assessing an audience. They are prepared for careers in various fields, such as academia/education, writing (journalism, literature, film studies), nonprofit organizations, medicine, law and business. Possible jobs include English educator, journalist, public relations specialist, marketing professional, research analyst or poet. The University of Maine at Presque Isle is accredited by the New England Association of Schools and Colleges. The Bachelor of Arts in English program at Columbia College is designed to help students learn critical thinking and communication skills and better understand the human condition through literature. Critical thinking and clear communication skills can be applied across almost every profession -- whether it be writer, editor, sales person, consultant or lawyer -- or effectively be combined with other academic areas for a more specific concentration. Students earning a B.A. in English online must complete 120 credits to graduate, including courses in general education, ethics, foreign language, multicultural, literature and electives. They also must pass a senior seminar class with a grade of C or higher. Note only the literature, not creative writing, emphasis is available online. Online students receive support from an academic adviser through to graduation and may access career services for assistance with finding jobs and internships, writing resumes and practicing interviewing skills. They can also speak with military services staff for help using GI Bill and MTA benefits and advice on transitioning to college. The cost of tuition for an online degree is set at a discounted rate of $375 per credit hour for undergraduates. Military undergraduates pay just $250 per credit hour. To apply, students must complete an application, authenticate their identity, submit an official high school transcript, GED or evidence of satisfactory college work, and a FAFSA if they need financial aid. If applicable, students may also submit official score reports for Advanced Placement, CLEP or DSST to the registrar. Columbia College is accredited by the Higher Learning Commission. An online Bachelor of Arts in English degree at Clarion University will prepare students for everyday life and almost every profession, including law, communications, advertising, sales and political activism. Students can also easily pair the degree with another academic major to create a more focused concentration. Online English students are required to complete 120 credits to graduate, including 48 for general education, 27 for liberal knowledge, 3 for health and personal performance and 42 for the English major. Core requirements include courses in literature, creative writing and linguistics. All online students must attend an online orientation conducted by a hands-on facilitator in real time. Students have access to resources such as a library, online tutoring, disability support services and career services. Online students pay lower tuition rates: Tuition and fees for a full-time PA resident taking 12 to 18 credits per semester at the Clarion campus is $11,125 (tuition for a non-PA resident is $16,004); whereas the tuition and fees for a PA resident taking a full-time course load online is $9,805 (the non-PA resident tuition is $11,084). To apply, students pay a $35 application fee, submit an official high school transcript and send official SAT or ACT scores. Students may also submit a GED, if applicable, and if the student received the GED more than 3 years ago, SAT or ACT scores are not required. Students are encouraged to include an essay and letters of recommendation, but these are optional. Clarion University does not specify a minimum SAT score to apply; however, the average SAT score is between 1030 and 1070. The school is accredited by the Middle States Commission on Higher Education. The Bachelor of Arts in English degree at National University is available online and requires at least 180 completed quarter units, including 76.5 upper-division units and a minimum 70.5 units of general education requirements. The B.A. in English program emphasizes analysis, composition and communication skills, which are necessary to be successful in almost all fields, including law, journalism, sales, marketing, consulting, fundraising and government. Students also may choose to concentrate in Creative Writing, which includes courses in fiction, poetry and screen writing. National University provides year-round enrollment, with new courses beginning every month. English degree courses can be taken 100% online, with students having access to math and writing centers, the National University System Library, Student Concierge Services, academic advisers and staff in admissions and financial aid. National University offers one tuition rate for both online and on-campus courses; however, tuition discounts are available for military personnel and their dependents. To apply, students must complete an admissions application and enrollment agreement. All entering undergraduates with no prior college-level English and/or math courses must take an evaluation as part of the admissions process. Applicants must have graduated from high school, passed a high school level proficiency test or received a Certificate of Proficiency from a state Department of Education. First-time college students are also required to attend an orientation class before enrolling. Transfer students are admitted from regionally accredited colleges and universities if their cumulative GPA is 2.0 or higher. The school is regionally accredited by WASC Senior College and University Commission. At the University of Memphis, students can earn a Bachelor of Arts in English entirely online through UofM Global. Two concentrations are available to online students: African-American Literature and Professional Writing. African-American Literature focuses on close analytic reading and critical thinking skills, while Professional Writing emphasizes communication skills for careers in publishing, business and technology. Both degrees require 120 completed credit hours for graduation, half of which are general education requirements, 27 taken in the major while the remaining hours are lower and upper division elective credits. Online students have an advisor, just like they would if they took classes on campus, to help them navigate courses and keep on track for graduation. In addition, students have access to Smartstart learning readiness assessment, 24/7 online tutoring and resources detailing online success strategies. Students also can engage with peers and instructors through email, discussion boards and blogging. Beginning in the fall 2018, UofM Global recently lowered its online tuition rates to $420 per undergraduate credit hour. To apply, students are required to complete an application, pay a $25 fee, submit official transcripts and SAT or ACT scores completed in the last 5 calendar years of the term for which students plan to enroll. Students must have fulfilled numerous high school requirements, including English (4 units), visual or performing arts (1 unit), mathematics (3 units), social studies (2 units), and foreign language (2 units). The school is accredited by the Southern Association of Colleges and Schools. The online B.A. in English/Writing at Eastern Oregon University provides a solid background in writing, rhetoric, literature and film, preparing students to be critical and creative thinkers, effective communicators and ready for careers in varied fields. To graduate, students must earn a minimum of 180 credit hours, with 60 of those in the English/Writing major, plus a minimum 2.0 GPA. Courses stress analysis, confident and original writing and tolerance for diversity of thought. Sample classes include Shakespeare, Expository Prose Writing, Professional Editing and Publishing, Introduction to Writing in Genres and Multicultural Literature. Course delivery and interaction with instructors occur through the online Canvas learning management system, email and fax. Some courses may require the use of a proctor for taking exams. 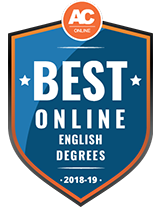 Graduates of the EOU online English/Writing degree are equipped to continue on to advanced study in literature, creative writing, rhetoric, education or law school. Possible career areas include journalism, politics, freelance writing, teaching, arts administration, editing and publishing, screen writing, film production or business venues that value writing and communication skills. EOU advisors act as personal coaches who work alongside students from admissions to graduation. Resources for online students include advising, tutoring, financial aid and career counseling services. The school is accredited by the Northwest Commission on Colleges and Universities. The B.A. online completion program in English, Technical and Professional Writing at Indiana University East teaches students to think critically and communicate effectively in various media. Graduates gain the skills and flexibility to succeed in today's workplace and are prepared for a career in a wide range of fields including advertising, public relations, social services or writing for publication. The online completion program allows students to complete the program requirements within 60 credit hours, or 20 classes. The student must have completed at least 60 semester hours of transferable college credit with a 2.0 GPA or better, or an associate degree at the community college level. The courses required to complete the online English B.A. are offered over 2 calendar years. The sequence of classes depends on the semester a student begins the program. Advisers work with each student for an individual plan of study. Sample courses include Technical Editing, Advanced Technical Writing, Studies in American Culture, Grammar and Usage, Digital Writing, American Ethnic and Minority Literature and History of the English Language. A minimum GPA of 2.0 is required to graduate. Online students enjoy the same resources as on-campus students, including academic advising, library access, online consultations with the school's Writing Center and financial aid. Indiana University East is accredited by the Higher Learning Commission. The B.A. in Individualized Studies at Granite State College provides students with an opportunity for interdisciplinary study in humanities, including the option for specialized study in English. Students interested in the Individualized Studies degree program are encouraged to meet with an academic adviser to discuss whether this customized option or one of the college's standard programs best aligns with their goals. Students enrolling in this major must take the 4-credit Conducting Critical Inquiry course to research their chosen field and develop an Individualized Studies proposal for approval by Academic Affairs office. Participants will gain skills in self-direction and proficiency in methods of inquiry and use of information resources pertinent to a specific area of study. Samples of Arts and Humanities courses in the area of English offered by the school include Introduction to Literature, Survey of American Literature, British Literature, Children's Literature, Creative Writing, Short Fiction and Shakespeare. Students have access to an online community of faculty, course materials, advisers, library services, career resources and fellow students. To graduate, students must earn 120 credits, of which a minimum of 32 credits must be in the major, with at least 4 of the courses upper level and maintain a minimum 2.0 GPA. Granite State College is accredited by the New England Association of Schools and Colleges. Graduates of the online English B.A. at the University of Maryland gain the analytical, critical and communications skills to succeed in graduate study or a variety of in-demand careers. Participants study literature and writing, improve their cultural literacy, learn to articulate ideas with clarity, conduct original research, and gain competency in conveying complex information in logical, accessible language. Courses include Standard English Grammar, Critical Approaches to Literature, History of the English Language and Post-Modern American Literature. The program is designed to prepare graduates for jobs in education, law, publishing, journalism, public relations, business and management. Graduates must earn 120 credits and a minimum 2.0 GPA. UMUC replaced textbooks with no-cost digital materials in most courses, so classes are taught using electronic textbooks, websites, UMUC Library resources, software and interactive exercises. Students can access course materials from any electronic device and study at their convenience, as long as they meet assignment deadlines. Classes are taught in 8-week sessions. Online students participate in discussions, work on group projects and interact with fellow classmates and professors. UMUC does not require applicants to submit SAT, ACT, GRE or GMAT scores for most programs. Students who have a U.S. high school diploma or GED or who have graduated from a U.S. college or university qualify for admission to the undergraduate school. Academic advising, tutoring, writing, library resources, financial aid and career services are available for online students. UMUC is accredited by the Middle States Commission on Higher Education. An online Bachelor of Arts in English is available at The Baptist College of Florida. This degree aims to prepare students for graduate degrees in English while also opening pathways for Christian service. Official high school transcripts as well as ACT or SAT scores must be submitted by prospective students who wish to pursue the Bachelor of Arts in English. Students who enroll in this program are expected to complete 120 credit hours and take major courses such as Survey of Christian Literature, History of the English Language and Studies in the Short Story. Students without previous postsecondary education are also required to participate in a 3-credit student success course, which provides them with the academic, personal and spiritual tools needed for success at The Baptist College of Florida. Students will need to use an online platform called myBCF to register for courses, check their grades, view campus groups and complete online assignments and exams. Some online courses will require participants to download and install Jenzabar's eLearning LockDown Browser so they can take certain exams. Students are encouraged to take advantage of academic advising services at The Baptist College of Florida to ensure they are enrolled in the correct courses and are eligible for graduation. In addition, students can use the online bookstore to purchase all of their books and other course materials. After graduation, some students work as copywriters, editors, journalists or marketing managers. Others further their education and earn a graduate degree in English or a related discipline. A Bachelor of Arts in English degree at Clayton State University is accredited by the Council for the Accreditation of Educator Preparation or CAEP. Students who enroll in this degree will use BrightSpace, an online learning platform, that will allow them to receive guidance from instructors, have discussions with classmates, submit assignments and take exams. They will be assigned to an academic adviser who will assist them with class registration and answer any questions they may have from the beginning of the program through graduation. The Bachelor of Arts in English is designed to help students improve their research and critical thinking skills. Students can choose from 1 of 3 concentrations including literature, writing and secondary education. They can expect to take such courses as introduction to literacy studies, critical theory and introduction to writing studies. Students who are interested in pursuing an online Bachelor of Arts in English from CSU must submit an official high school transcript or GED scores and a minimum ACT score of 17 or minimum SAT scores of 22 in math and 24 in reading. Following graduation, some students pursue graduate school and focus on English, library science or creative writing; other students choose to enter the workforce in public relations, marketing, education or many other industries. Mercy College offers a Bachelor of Arts in English that can be completed online. For admission consideration, students are required to submit their high school transcript or GED as well as information on any extracurricular activities they were or are involved in. Since Mercy College doesn't believe test scores are a true representation of a student's ability, SAT and ACT scores are optional. The purpose of the Bachelor of Arts in English is to help students strengthen their literacy skills through reading and writing. Students who enroll in this program can improve their critical thinking and communication skills so they can pursue a variety of careers. This is a 120-credit-hour degree that begins with foundation courses such as survey of English literature and poetics: an introduction to literary texts. It also consists of courses in 4 categories including classical, social and cultural, genres and historical. The Four-Plus-One program gives qualified Bachelor of Arts in English students the opportunity to pursue their master's degree at an accelerated pace. If they hold a 3.0 GPA in the Bachelor of Arts in English program, they may apply for the Master of Arts in English during the first semester of their junior year. Students who are interested in becoming an English teacher are encouraged to consider Mercy College's 5-year dual degree program that includes courses in secondary education, childhood education or early childhood education. Many Bachelor of Arts in English graduates are seen working as copywriters, editors, journalists, communication managers and publishers. West Virginia State University offers a Bachelor of Arts in English-Technical Writing that is accredited by the Higher Learning Commission. This degree can be completed entirely online and eqips students with the knowledge and skills necessary to pursue successful careers in writing and communications. Students who enroll in the Bachelor of Arts in English-Technical Writing will improve their critical thinking and reading comprehension skills and gain valuable experience preparing reports and technical documents. The requirements for admission into this degree include a high school diploma or GED with a minimum GPA of 3.0 or a minimum 2.0 GPA and test scores of 18 on the ACT or 870 on the SAT. This program consists of 120 credit hours that include general education courses, English core courses, cognitive courses and elective courses. A few examples of the required English core courses are technical writing, writing for business and other professions and editing for technical writers. Transfer students can transfer a maximum of 72 credit hours from a community or junior college. Upon graduation, students may become technical writers in numerous industries like computer hardware and software, chemistry, engineering, finance, robotics, biotechnology and consumer electronics. They may also pursue careers as copywriters, editors, communication specialists, editorial assistants or public relations generalists. Some graduates will choose to further their education by earning a graduate degree in writing, literature, education, instructional technology, law or any other related field that piques their interest. At University of Massachusetts Lowell, students have the opportunity to earn a Bachelor of Arts in English online. This degree is designed for students who are interested in creative or professional writing or literacy studies. It can help them improve their writing and critical thinking skills. Students who enroll in this program are encouraged to work with academic advisers as well as the English degree program coordinator to design a curriculum that is right for their academic and professional goals. To be considered for the Bachelor of Arts in English at University of Massachusetts Lowell, students must hold a high school diploma or GED. Once students are accepted into the program, they are required to earn a minimum GPA of 2.0 and complete 120 credit hours or 40 courses in order to graduate. The 40 courses must include core courses such as English studies in a digital environment, American literary traditions and British literary traditions. They are also required to complete at least 6 English electives like introduction to creative writing, scientific and technical communication and great books of the modern period. Additionally, there is a foreign language requirement in which students can choose the world languages or world ready track option. World languages involves taking 4 consecutive courses in a foreign language like Spanish or French while world ready consists of 2 consecutive courses in a foreign language and 3 world ready courses, which focus on the culture, history and politics of the foreign language. Following graduation, students may pursue a variety of career paths such as copywriting, editing and teaching or may choose to enroll in a graduate degree program to further their education. Southwestern Assemblies of God University's Bachelor's of Arts in English is accredited by Southern Association of Colleges and Schools Commission on Colleges and can be completed online. It was established to inspire students to develop a love and appreciation for writing, literature and thoughtful expression, and empowers students to develop their own voice. Admission requirements include an official high school transcript that shows the date of graduation and a minimum GPA of 2.0 or proof of a GED. This program consists of 120 credit hours and courses such as advanced grammar and composition, introduction to linguistics and American literature. Since Southwestern Assemblies of God University is a Christian university offering a Bible-based education, students who wish to complete this degree must also complete general biblical courses like introduction to biblical literature, the church in ministry and mission and introduction to theology and apologetics. Students who graduate with a Bachelor of Arts in English from Southwestern Assemblies of God University can pursue a plethora of careers such as copywriters, editors, journalists, marketing communication managers, social media managers, technical writers and much more. In addition, they may continue their education and pursue a graduate degree in education, law or any other field of interest. At Thomas Edison State University, students may earn a Bachelor of Arts in English online. This degree focuses on traditional liberal arts disciplines. By enrolling in a Bachelor of Arts in English from Thomas Edison State University, students can improve their writing skills and prepare for various careers or a graduate education. For admission consideration, prospective students must hold a high school diploma or equivalent GED. Although the SAT and ACT are not required, international students must provide TOEFL or IELTS test scores. Since Thomas Edison State University operates on a rolling admission basis, prospective students are welcome to apply to the Bachelor of Arts in English program anytime during the year. To earn this degree, students must complete 120 credit hours that consist of general education courses, English courses and elective courses. Required English courses include survey of literature I and II, analysis and interpretation of literature and Northwestern literature. There is a long list of electives that students may choose from including development of English drama, social protest literature and 20th century English. Heritage University offers an online Bachelor of Arts in English that is accredited by the Northwest Commission on Colleges and Universities (or NWCCU) and focuses on multiculturalism. Students who would like to pursue this degree are required to submit an official high school transcript or GED transcript as well as ACT or SAT test scores. Those who have accumulated credits through CLEP or AP coursework will be given credits. In addition, there are private aid scholarships that are only available to Heritage students. Students in this program build critical thinking skills and enhance their knowledge of cultural and gender issues around the world. To earn this degree, students are required to complete a minimum of 120 credits and core courses such as introduction to ethnic literature, applied linguistics and survey of British literature. Students must also complete 3 credits of advanced writing courses such as creative writing, technical and report writing and advanced composition. They must meet with their advisor on a regular basis to ensure they are on the right track for graduation. With a Bachelor of Arts in English, students can pursue careers including educators, journalists, copywriters, researchers, grant writers, fundraisers, non-profit directors or librarians. They can also continue their studies and pursue a graduate degree. Students at Western New Mexico University can pursue a Bachelor of Arts in English completely online through Canvas, an open-source learning management system. Western New Mexico University offers a short, non-credit course for students new to Canvas, and prospective students can apply for the Bachelor of Arts in English by submitting their official high school transcripts or GED scores as well as ACT or SAT scores that are less than 5 years old. This degree is designed to help students become critical thinkers and will prepare them for a variety of careers. The Bachelor of Arts in English is 120 credit hours and includes 36 credit hours of English courses such as introduction to literature, American literature and Shakespeare. Students may choose to concentrate in literature or writing and must complete a minor to graduate. While many students who graduate with a Bachelor of Arts in English from Western New Mexico University decide to pursue a graduate degree in law, English, teaching or another field, some choose to work right after graduation. Graduates may pusue work as grant writers, technical writers, editors, marketing or public relations professionals or teachers. English graduates can pursue nontraditional, online professions, such as writing for digital publications rather than print newspapers. They might also self-publish their own novels, create blog posts, and craft video scripts for web channels. Distance learning prepares English majors for these types of writing careers by giving them experience with working and communicating remotely. This page covers online English degrees and careers, with information on job outlooks, salaries, program curricula, concentration options, and financial aid opportunities. Online English degree holders can explore careers related to book publication, speech construction, instructional guides, and marketing plans. These graduates can also write television screenplays, play scripts, biographies, and press releases, or pursue an English graduate degree to teach literary concepts in college classrooms. The following chart provides salary and job growth details for bachelor’s-level careers in the field. English majors who want to earn more than $100,000 per year might use their program electives to prepare for a career in public relations management. Note; however, that a degree does not guarantee a particular career or salary. Editors review documents for grammar, accuracy, and clarity. These workers make corrections and provide feedback for writers. Additional responsibilities include choosing which pieces to publish, in what order to publish them, and how much room each piece requires. Editors perform these tasks for newspapers, books, websites, and magazines. Earning an English bachelor’s degree online prepares candidates for these positions. Writers may create web content, marketing content, books, or poetry, among other nonfiction and fiction works. Authors explore fictional and nonfictional subjects and research related topics as needed. For example, an author writing a story based in Norway should understand the country’s geography and customs. Companies hiring writers often look for a bachelor’s in English or a similar field. These specialists promote positive images for clients by communicating with media contacts and creating press releases and speeches. PR specialists decide which advertising options fit their company’s public image and guide clients in engaging with the public. Candidates should hold a bachelor’s in a PR-related field, such as English. These workers write instructional pieces, including how-to guides, that explain complicated concepts in simple terms. Writers may use drawings, photographs, and charts to help readers process information. Writers must update instructional guides over time, keeping consumer responses to products in mind. Candidates should hold a bachelor’s degree, and potential field experience related to the product, such as computer experience for creating software instructions. These managers help clients maintain positive public images by assessing goals and searching for promotional strategies. These workers explore funding options and guide interactions between clients and consumers. Managers construct press releases, pursue grants, guide company staff, and plan fundraising events. Companies require a bachelor’s for these positions, but some organizations may insist on a master’s. Salaries vary based on several factors, particularly geographical location. For instance, editors who live in high-cost areas may earn more than those in low-cost locations. Advanced degrees may further increase your earning potential. The District of Columbia, Massachusetts, and New York pay editors more, on average, than other states, and areas near San Francisco and Redwood City also offer high pay. The District of Columbia, New York, and Virginia host the highest concentrations of editing jobs. Financial investment opportunities provide the highest pay for editors, and publishers offer the highest career concentration. The below information helps candidates choose lucrative positions in their areas and find other living areas with employment potential. Students working toward a bachelor’s in English encounter writing and literature courses, as well as general requirements and electives. Degree requirements may vary based on your concentration. For example, students who specialize in media writing may face coursework on constructing magazine pieces, biographical works, and internet publications, while a creative writing focus may involve poetry, screenplays, and short story classes. Still, a few common themes — such as genre examinations, literary periods, and insights on the English language — surface across programs. These courses present learners with foundational literature concepts, such as genre characteristics and field vocabulary. Candidates learn to determine literary meaning based on techniques, structure, and theories. English composition courses guide students in writing particular documents, such as argumentative pieces, or educate learners on multiple writing types, including research papers and personal essays. Candidates use this information to organize papers throughout the program and in professional settings. Learners explore British authors and works through historical and cultural contexts. Often, departments offer this information in two courses, requiring students to write analytical reactions to relevant pieces. Programs may also offer similar courses for American literature. Students learn the basic elements of fiction, such as plot, perspective, character building, setting, and genres. Coursework may include examining popular fictional works and constructing original pieces. Learners explore the evolution of English, along with written works from different language periods. Students consider the historical, cultural, and social context of language, as well as syntax and semantics. Students should consider their career goals in choosing an English program. For example, learners who want to teach literature might prefer programs that focus on analyzing written works, while those who want to write short stories might select a creative writing concentration. Students should account for prospective schools’ accreditation, reputation, and faculty, since these details influence degree value. Candidates should also think about program cost. How will studying online impact my degree? Many schools offer the same coursework for on-campus and online learners, and most English programs do not require an internship or practicum. For these reasons, students can usually complete an English degree online without issue. Furthermore, degrees and transcripts for online programs may look similar to credentials earned by on-campus learners, with no mention of distance learning. However, these details may vary by institution, so degree seekers should ask their schools for more information. Will there be a capstone project? Some programs require a capstone project, which require students to create a portfolio or complete a major research project. Some institutions insist that English majors complete senior seminars, while others may not require a wrap-up course at all. For specific information, degree seekers should review their department’s program requirements. Each department requires its own set of courses for online English students, but most allow students to choose their own field-related electives. For these requirements, degree seekers should select classes that cater to individual goals. For example, learners interested in pursuing further study of Mark Twain might dedicate an upper-level English elective to a course focused on this author. What should I look for in department faculty? Some professional authors and writers may teach college courses. Students pursuing a bachelor’s degree in English under the guidance of such professors gain professional writing, publishing, and marketing insights. For instance, a hopeful science fiction writer can look for published science fiction authors among faculty. Moreover, a candidate can seek out faculty with academic specializations that match their personal interest, such as Shakespeare, newswriting, or American literature. Will this degree help me achieve my career goals? Some English-related careers, such as public relations and editing positions, may require a bachelor’s degree. Fictional book authors, on the other hand, do not need a bachelor’s to earn a publishing contract. However, candidates can build notoriety by writing for companies that require a degree, which may translate into book sales and successful careers as published authors. In these cases, a bachelor’s degree can assist in career development even when it is not required for a particular position. Pursuing an online bachelor’s degree in English incurs tuition and textbook expenses, as well as academic fees. Students who cannot afford these costs might explore financial assistance methods, including tuition reimbursement plans from employers and private and federal loans. Not all companies offer reimbursement opportunities, and student loans can take years to repay. For these reasons, college students often prefer grants and scholarships that require no repayment, such as the following scholarships for English majors. Freshmen, sophomores, and juniors at historically black colleges or universities should apply for this award from Go On Girl! Book Club. Applicants must hold a 2.5 GPA and craft an essay concerning the impact of writing. Recipients earn $1,000, and may attend the group’s yearly award event. The organization also publishes the recipient’s writing in a journal and newsletter, and supports the writer on its website. Undergraduate juniors and seniors, along with graduate learners, may qualify for funding from the American Copy Editors Society (ACES). Candidates must intend to work in news. Applicants submit a resume, three references, and verification of editing experience. Applicants must also respond to an essay prompt and supply evidence of news reporting skills by creating headlines and revising a portion of a news report. Recipients may not reapply for this funding. ACES states no specific amount for this scholarship. Mystery writers may apply for this scholarship to attend workshops, seminars, or higher education programs to improve their writing skills through review and critique. Applicants must submit information about their intended program, plus a writing example and an explanation of their fascination with mystery. Scholarships start at $500. The Horror Writers Association presents this scholarship to female authors in the genre. Recipients may use the $2,500 award to pursue writing education, including textbooks, or to participate in professional opportunities, such as writing conventions. Applicants must create an outline of how they intend to use the award. Recipients should also supply a biography and photograph, and participate in interviews to promote the scholarship. High school students intending to become journalists may qualify for this scholarship. Applicants must hold a 3.0 GPA and submit a Free Application for Federal Student Aid, a transcript, and recommendation letters. They must also supply three examples of written or visual journalistic pieces. Candidates should also provide an acceptance letter from a college or university. Students may only receive this scholarship once.